BreakFAST - Overnight Oatmeal is the Best Trick Around! I don't know about you but I am and always have been a breakfast person. Not only am I hungry within 20 minutes of waking up (regardless of the time), I will also eat breakfast for every meal of the day if given the chance. Because I am pretty much useless and very hangry if I don't eat when I wake up, I have learnt a few tricks to make sure I get my beloved breakfast. As a side note, I am also always running late in the morning because I hate waking up. As I said in my last post I am not a morning person! Usually, I have poached eggs and toast. To stay on target I put the water on to boil after I blow dry my hair, while my straightener is warming up, and by the time my hair is done the water has boiled (9 times out of 10 I eat my toast on the way out the door...it is not a perfect system)! My second favorite breakfast is oatmeal but I find it hard to eat while running out the door, mainly because it is so hot! To save time in the morning I thought I would test out and share with you Overnight Oatmeal. I first heard about overnight oatmeal on my favorite blog A Beautiful Mess. About two years ago, I discovered their post called Oatmeal 9 Ways. This post made oatmeal exciting again (naturally oatmeal was at one point an exciting feature of my life). A few weeks ago, they posted about this overnight oatmeal and again, my mind was blown. Now, I not only have a bunch of ways to make oatmeal delicious but I don't have to attempt to cook it in the morning and subsequently burn my mouth off every morning. That may be dramatic but you all know what I am talking about! I was a little confused when reading the recipe because there is no cooking step. After a little more digging on a different blog I figured out that the "cooking" happens overnight as the oatmeal absorbs the liquids. Brilliant. What is even better is that during my oatmeal research, I discovered what is by far the best oatmeal recipe ever - Apple Pie Oatmeal! Oh man is it delicious. I found it on a Canadian blog called Oh She Glows. 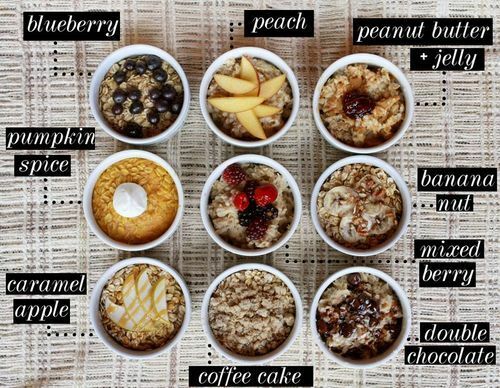 She has posted some more awesome oatmeal recipes as well as her own version of over night oatmeal. Between these two blogs I now have enough oatmeal recipes to keep me happy. My next step is to not only try them all but to try them over night-style too. I hope you enjoy having dessert for breakfast and can incorporate these awesome recipes and neat tricks into your morning routine.